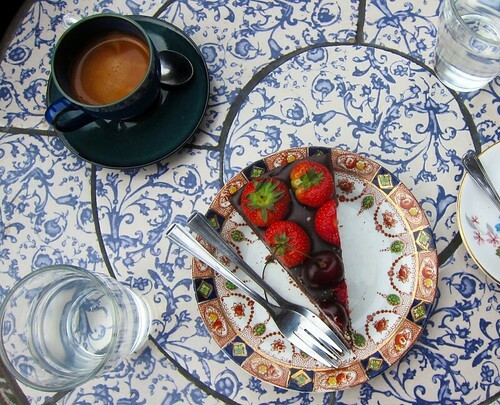 My imagination, however, requires more than just pretty sights – it requires food. (Did ya like that transition? Heh heh.) Luckily Edinburgh did not disappoint in the realm of vegan food! On our first day in the city, we enlisted the help of our city-savvy host, S’s friend, to find the Baked Potato Shop. The shop is truly a hole-in-the-wall just off bustling Cockburn Street (that’s pronounced “co-burn” – stop giggling! ), with a single booth inside and a line out the door. On this first visit, we were lucky enough to snag a booth in the steamy interior – apparently, bakin’ up potatoes all day long lets off a lot of heat! 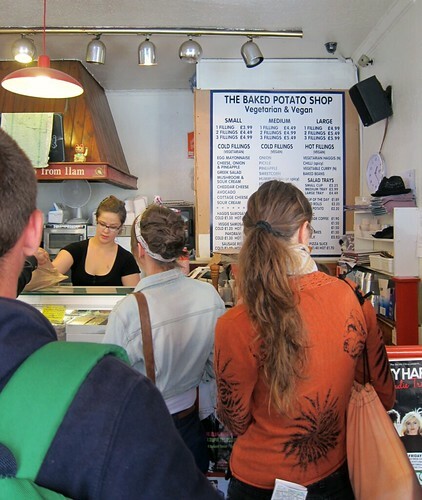 Although baked potato joints are quite common in Edinburgh, this particular one is notable for its vegan friendliness. Its menu clearly lists which topping are vegetarian and which are vegan – very helpful, as long as you can actually see the menu over the heads of hungry folks waiting in line! No interior organs in this haggis…! I was very excited to try vegan haggis… not that I’d ever had real haggis. I didn’t know what to expect, but this stuff was delicious. I believe it was a blend of ground nuts and grains with lots and lots of savory spices, and it made the perfect counterpart to the more neutral potato flavor. Yum. My only complaint about my Baked Potato Shop dining experience is that they really should offer sturdier silverware for anyone who’s dining in – that little plastic fork could not hold up to a thick-skinned, fully loaded potato! Pretty much fudge on a plate. That tart was every bit as rich and fudgy as it looks. 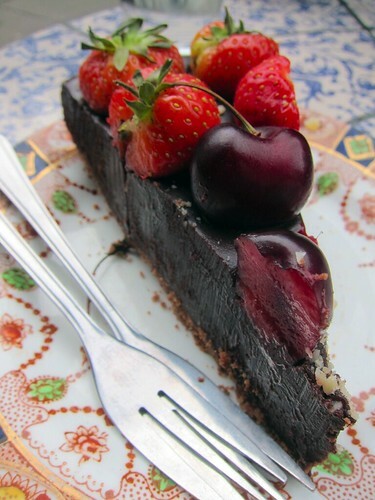 Thank goodness for those berries – I’m not sure even I could handle so much unadulterated chocolate! We enjoyed our tart and espressos outside, thankful for the easily accessible jars of lemon water to help us wash down all that chocolate and coffee. Oh yes. 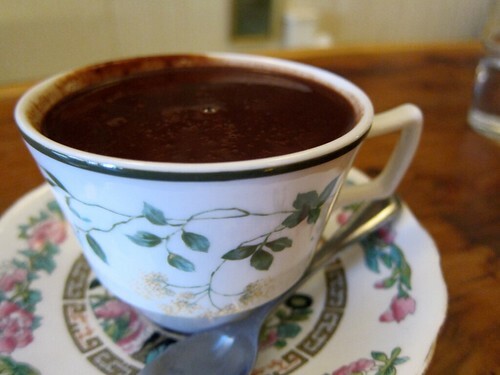 That is basically melted chocolate – so, so rich. It was delicious, even if I had to enlist S’s help in finishing it. (He was happy to help – his soy latte was disappointingly weak.) If I could change one thing, though, I’d have added more spice to it – I couldn’t really taste whatever spices were in it. On that trip to the shop, S and I also picked up a few dark chocolate bars to add to my snack stash. The Winter Spice bar, featuring “a cozy blend of organic gingerbread spices and organic dark chocolate,” was particularly droolworthy. 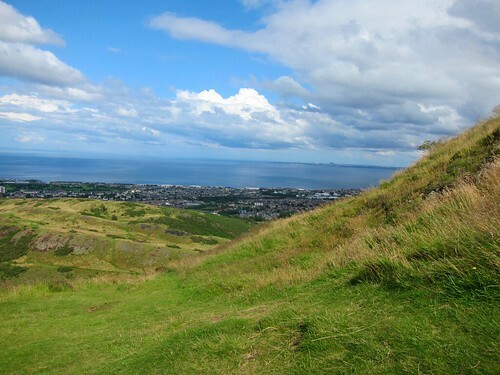 With all that chocolate as fuel, S and I conquered the climb up to Arthur’s Seat with our host as a tour guide, taking us up a few rather less-than-beaten paths. But the view was totally worth scrabbling up rocks and scraping our palms. The way back down had its fair share of fantastic views, too. 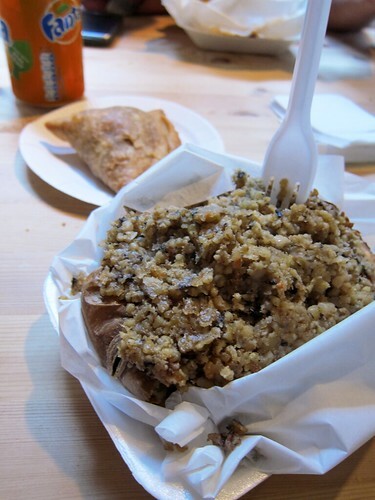 Have you tried vegan haggis? Or… real haggis?! Love this post! I’ve always wanted to go to Scotland and looking at all these lovely vegan treats makes me want to visit even more. A chocolate cafe? That sounds amazing. I’ve had vegan haggis before (also on a baked potato) and while I’m sure it tastes nothing like ‘real’ haggis, I really liked it as well. I’d love to try the samosa… Looking forward to reading more about your trip and your favourite eats! I’ve never had vegan haggis, and I don’t recall that even being a possibility years ago when we were in Edinburgh, but it sure looks good. Some things have changed bit as far as vegan food goes. 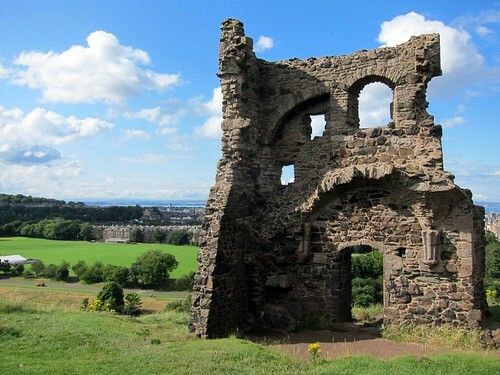 Other things, like the gorgeous scenery and castles, still seem as wonderful as ever.